One MoorMaster™ unit will be installed at each of the five berths, where they will be used to moor (dock) two new e-ferries that will carry passengers and vehicles between Amherst and Wolfe Islands on Lake Ontario, near Kingston, 200km east of Toronto, Ontario. MoorMaster™ is a vacuum-based automated mooring (docking) technology that eliminates the need for conventional mooring lines. Remote-controlled vacuum pads recessed in, or mounted on the quayside or pontoons, moor and release vessels in seconds. The technology has completed more than 400,000 mooring operations at ferry, bulk and container handling, lock and ship-to-ship applications worldwide. MoorMaster™ is ideal for use with e-ferries because it reduces mooring times and holds vessels in pre-programmed positions. This maximises the amount of time available to charge ship battery units. The Amherst Island ferry will be 71m in length and carry up to 300 passengers and 40 vehicles. The Wolfe Island ferry will be 98m long and have capacity for up to 399 passengers and 75 vehicles. The Amherst vessel is due to enter service in 2020, with the Wolfe Island ferry scheduled to do so a year later. According to the vessel manufacturers, Damen Shipyards in The Netherlands, the two ferries will reduce emissions by the equivalent of seven million kilogrammes of carbon dioxide a year. Earlier this year, Cavotec announced orders valued at some EUR 9m for automated mooring units for use with e-ferries in Norway. 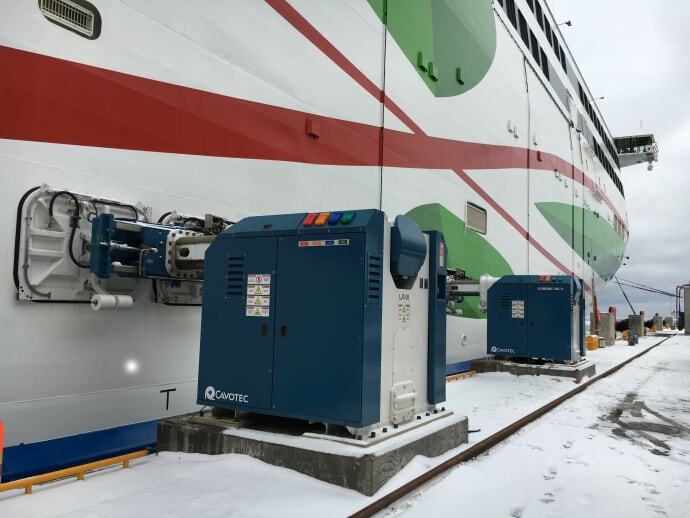 On completion of these projects, Cavotec will have equipped more than 40 e-ferry ports across the Nordic region with MoorMaster™, thereby delivering substantial operational and safety benefits for ferry operators. MoorMaster™ is already in use throughout the 15 locks of the 600km-long St. Lawrence Seaway that forms a crucial trading route between Canada and the US, and provides shipping access between the Atlantic Ocean and the Great Lakes.